The whole business of making things with raised panels has given me lots of thought over recent years. But router bits sets for making raised panels are relatively expensive, and very limited in terms of thickness of material they can handle. 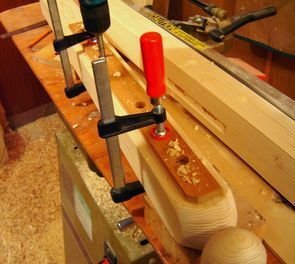 They also prevent the use of mortise and tenon joints on the frame, because the throat depth on the router bits is too small to accommodate a tenon. So I did an experiment to see how well I could shape the frame more by hand. I just made the panel flat (no need for a bit), and used a quarter round router bit as far as I could into the corner, and then carved all the way into the corner with a chisel. So I could approximate the effect of the raised panel router bits this way. Though labour intensive, I was reasonably satisfied with the results. I wouldn't do a whole kitchen this way, but I figured it might be good for a project. I figured this approach would be nice for a headboard for a bed, and I wanted to build a new bed frame anyway. So I bought the lumber and started working away at it. I decided to go with a non-square shape for the panels. I first cut out the basic shape with a bandsaw, and then put it together with square mortise and tenon joints. For the panel, I decided to use some very nice 5-ply 5/16 inch birch plywood that came from a discarded shipping crate. Luckily, I had a router bit of the same thickness, but that bit had no guide roller. 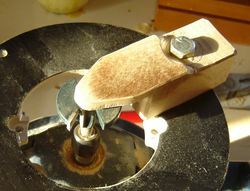 So I made a fixed guide, and bolted that to the router base - see image above right. That worked surprisingly well. After I cut the grove into the frame for the panel, I realized that I no longer could use the guide roller on my quarter round bit, because I had cut a grove right where the guide roller would press against the wood. Oops! 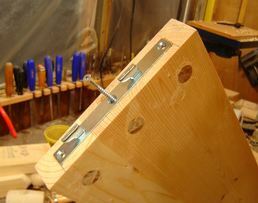 I could have made another wooden guide like I did with the other router bit. 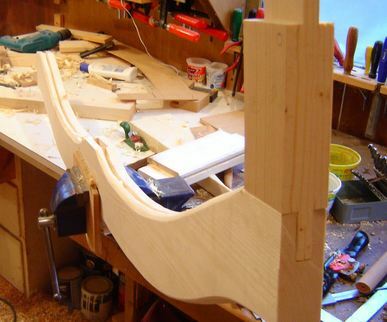 But I had been thinking of giving the whole bed a bit more of a hand-carved look, so I just carved an approximation of the quarter round profile with a draw knife and a spoke shave. I used the same approach to carve the outside edge of the headboard, especially because I didn't have quite the right shape of router bit for the profile I wanted. The next step was to make the posts for the bed. 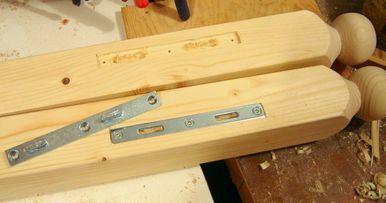 These I glued together out of two pieces of lumber to get the right thickness. Two 2x4's would do the trick, but I have found that I can get much better quality lumber by buying 2x10x8 pieces. These, by necessity, have to come from larger trees, and as such tend to be of higher quality. The price per unit of lumber is of course more for these, but using construction lumber for furniture is in general quite cheap, so it doesn't add much to the cost. For the tops of the posts, I decided on a ball shaped top. 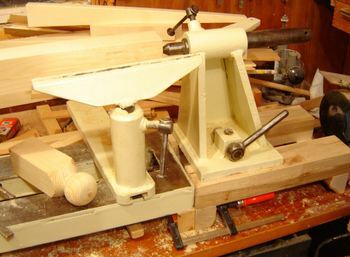 I wanted this to be an integral part of the posts, so this required turning the whole posts on my lathe. 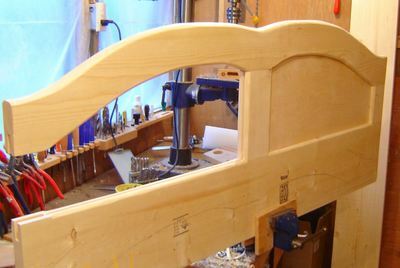 Now, my lathe is quite big and heavy, but the lathe was not quite long enough to mount the posts for the headboard side of the bed. It is however very low tech, so it was relatively easy to build an extension for the tail stock of it out of wood. I left a little bit of wood past the knob, which I cut off afterwards. That way, the hole I had to drill for the dead center to turn in, and the oil I had to put on it to let it run smooth, were cut away. The next step was to attach the headboard to the posts. 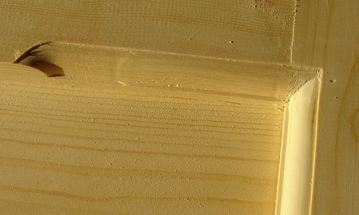 Normally, for this type of joint, I would have used a mortise and tenon joint. But, I found myself unable to cut the tenons at the ends of the headboard. For one thing, with my tenon cutting jig on my table saw, the distance between the top of the saw and the ceiling was just shy of the width of the head board. I had thoughts of using my mortising machine to cut the tenons as well, but decided that that just wasn't worth the hassle to try and risk messing up what was shaping up to be a very nice headboard. Strength for this joint wasn't that critical anyway, so I just decided to dowel it. Of course, one problem I can always avoid with mortise and tenon joints is worrying about precise dowel hole alignment. 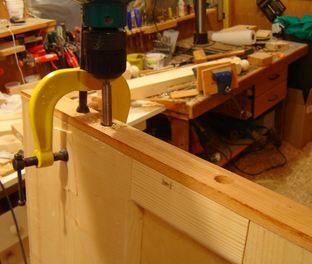 So I had the idea of just drilling four holes into a piece of hardwood, and drilling through that as a guide to produce repeatable hole alignment. This worked well in terms of getting the holes aligned precisely, but with a catch. I couldn't fit the headboard in my drill press, so I just drilled them freehand. I'm usually pretty good at judging right angles, but for two of the holes, I was about five degrees off in one axis. I compensated for this by sanding a taper on one side of the dowels for those holes, and just plain banging hard when I attached the headboard to the posts. I have since then built a horizontal boring jig to avoid this problem. 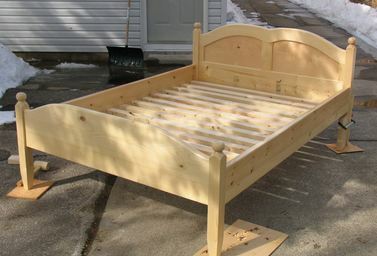 This being a "proper" wooden bed, it has bed rails on the sides of the mattress. I attached these using bed rail hooks, so the whole bed can be taken apart easily. I bought these at the Home Depot. The Home Depot calls them "bed rail clips", but you will have more success on the internet searching for "bed rail hooks". (Update: Home depot no longer sells the large ones. You can however get these from Rockler.com). To help hold the screws in the end grain, I put some dowels through the bed rail so that the screws holding the bed rail clips actually have some cross-grain hardwood to thread into for a better grip. These are blind holes, so only visible from the mattress side when the bed is assembled - see image at right. The side rails also have a ledge on the inside to hold the slats (not yet mounted in the picture at right). The slats essentially are supported by the bed rails. 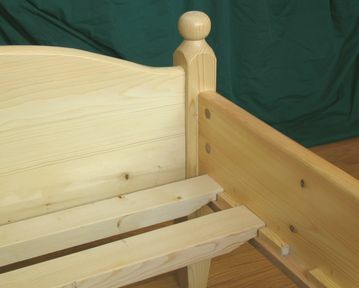 The foot board for the most part is the same as the head board, but shorter, less curved, and without any panels in it. The bed was too large for me to be able to assemble it in my workshop, so I didn't actually assemble it completely until after it was all done and varnished. The first time I put it together was in my driveway. After I took this photo, I shortened the legs a little bit, and also tapered the ends of the slats a little so the mattress would sit a bit lower (see picture at bottom left). The next test assembly was in my living room with the mattress in it. At that point I decided to taper the ends of the slats so they would rest a bit further down in the bed frame. This brought the mattress down by about a centimeter. 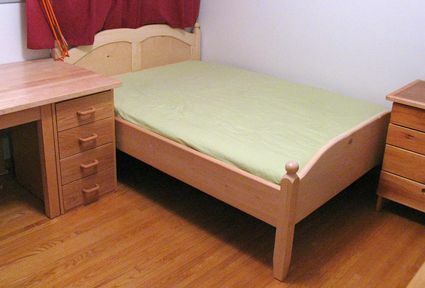 The mattress to use with a bed frame like this is a relatively thin one (8" / 20 cm or less), because the slats are relatively far up. I think it looks better that way, and provides ample storage space undeneath.